Inspired by this sketch, I used stamps, dies and the Blushing Rose Paper Collection from Our Daily Bread Designs to create my card. All papers are from the Blushing Rose Paper Collection, I sponged the edges with Ranger Gathered Twigs Distress Ink. The quote is from Quote Collection 4, stamped in Coffee Archival Ink on Vanilla card stock and die cut using the Matting Circles Dies, layered on an Espresso panel that was die cut with the Circle Ornaments Die. To embellish I die cut the small heart from metal using the Ornate Hearts Dies, buffing the embossed area to expose the silver metal. I also added butterflies using the Stamped by - Butterfly Mini that were stamped on scrap pieces of the pattern paper, Zva Creative Silver Metallic Gems and a flourish cut from Moss card stock using the Fancy Foliage Die. If you would like to play along with this weeks Bloggers Challenge, please link back to this post on your blog and mention you created your card for the Bloggers Challenge Metal Challenge. Please add your link using the Link Tool below, your link should be a direct link to your Bloggers Challenge Post, use your name as the Title. Please do not link to cards that were created prior to the challenge date. Entries not linking properly, or backlinked will be removed. If you have the captcha enabled on your blog, please consider turning it off, as it makes it so much easier to leave comments. I love your card design, Lisa...it's gorgeous! 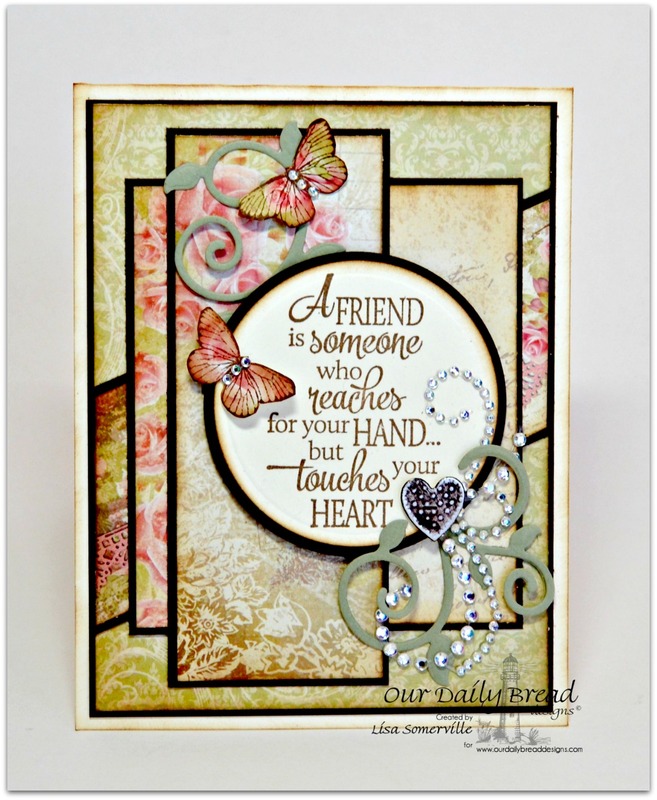 I never thought to use that little butterfly from the mini Stamped By stamp, but I'll be using it in the future! Thanks for the inspiration! Hugs!